On September 24th I published an article analyzing the Gartner report about Social business offerings. In it I mentioned the lack of a roadmap for IBM Connections Cloud (SmartCloud). The issue keeps resurfacing. So far it has been met mostly with diversions and redirects: “Why do we need a roadmap published?” or “We already have webinars and meetings with customers and present the roadmap to them“. I will say Luis Benitez has done a great job of posting information in various external sources like this slideshare or on his personal blog website (Still not official and only covers the Connections functionality of Connections Cloud and it not a roadmap). And of course there is the official IBM wiki website with the “What’s New” posting highlighting some features after the update, although not all changes are mentioned here, like the update to the ActiveX control for Internet Explorer which was pushed out without warning last Wednesday, outside the usual maintenance window; and the post contains no history of earlier releases. All of these are only partial lists of what features are being working on or have been released to the service and they miss some of the key points of a roadmap. Perhaps the name Roadmap is misleading. Timeline might be more accurate. I will take a moment to clarify what exactly I am looking for in a roadmap and why I think it is so important. A roadmap does not need to show the next 2 years of features coming. Requirements change too often to be reliable and it would be unwise to tip their hand and show the competition too much about what they are working on. But it should show the short term list of features that are imminent, within the next 2 to 3 months. Why is this so important? Because Cloud is not like software. First, there are no beta releases for us to play with in advance. Second, there is no SPR listing for it like there is for software, like Notes/Domino. Third, customers cannot chose to delay or avoid a release like they can with software updates. Therefore we need enough advanced notice to prepare for the new features. This often requires communications to our user communities of the impending changes. Larger organizations often have a series of reviews that the communications must pass before being sent out. The help desk may need to get special instructions or at least be prepared for the calls that will inevitably be generated. Administrators may need to request the feature be enabled once it is available, like using federated login method for mobile apps. The single most important reason for posting the date a feature was added is for troubleshooting. In an environment where the customer is controlling the installation of software, they can track when the software was installed or upgraded. So correlations of when the change was made and when a problem started happening are possible. This is not the case in a cloud service environment. Therefore it becomes an essential role of the cloud provider to document and publish the dates that new features are released. Without it, it can take much more time identifying and resolving issues. Sometimes plans change. It is better to show the changes than to have them simply disappear. This is not a legal contract, only a guide to help inform the customers. Changes are OK.
Trust is essential to getting companies to buy into your solution. The historical data will provide a track record that demonstrates how much work is continually going into improving the service which will build confidence in both current and potential customers. In other words, a roadmap doesn’t just show you what is coming, it also shows where you’ve been and where you are now. Just like the GPS in your car shows where you are and the roads around you for safe navigation. Without the ability to see these things, customers are driving blind. That is why we need a roadmap for IBM Connections Cloud. If you are a CTO, IT director, computer professional or enthusiast of cloud computing technology, you won’t want to miss out on this meeting of the Seattle Technical Forum meetup group. 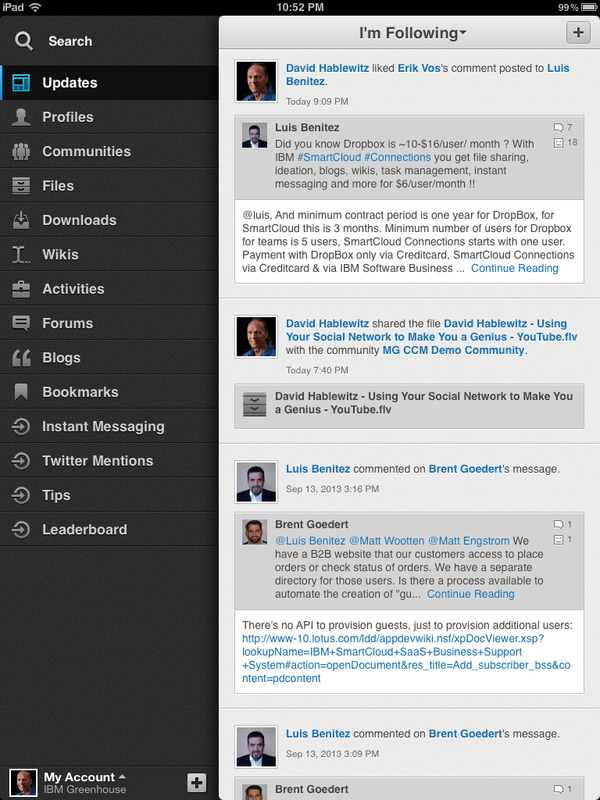 I will be presenting a demonstration of SmartCloud for Social Business with IBMer David Bell. This will show off what is sure to be tagged as “The next Facebook”, business style. When you move to SmartCloud Notes, you get many great benefits, but of course there are a few tradeoffs. One of those is giving up Manager access to the mail files. Whether you’re the mail file owner or the system administrator, the best access you’ll ever have is Editor. And unless you explicitly configure it otherwise, by default only the mail file owner will have any access at all. This is actually great for enforcing best practices. Users should never have more than editor access anyway, and in countries like France, the law prohibits administrators from accessing a user’s mail without their permission. Yes, the owner can always use delegation to grant others access to their mail file, but that only works if they are available to give that access. That doesn’t help for employees that are out sick or no longer employed at your company. If you want anything other than the default, you need to plan ahead because once the mail file has been migrated, you can’t change the ACL. This means adding certain groups and roles to the ACL of the existing mail files as well as to the template for any future mail files. There are typically 3 groups you will want to add to the ACL. The first is your administrator group. Without this, administrators can’t perform some basic administrator tasks, like opening the mail file to do troubleshooting. The second group that may need access are support personnel who may need access to the mail files, but should not be included in your administrator group. For example, this may be regional administrators, or designated people on the help desk, or HR, or the legal department. How you organize these groups will vary depending on the organization and size of your company. Note that you need a different mail template in SmartCloud for each different ACL. For example, you will need a different template for each region if each region will have a different group of regional administrators. The third consideration is providing access for your application servers in the event you have applications that run agents that directly touch the mail files. Keep in mind that no agents can run on directly on the SmartCloud mail servers so any agents will need to be run on a server you maintain on site. Typically databases use mail routing to get things into your mail file, but I have encountered a few applications that add entries directly to the calendar. The process of assigning access to these groups is simple, but must be done in advance of migrating the mail files into SmartCloud and also requires modifying the ACL of your mail template that will be posted in SmartCloud so future accounts created in the cloud will have them. First, create a role called ExcludeDelegate in the ACL of the mail files, then create the three groups mentioned above as you need and apply that role to them. (More on exactly how to do this later.) The following screen shot was taken from the database catalog and shows these ACL entries framed in red boxes. Note that regardless of what level of access you give these groups in the mail file on site, it will not have more than Editor when it is moved to the cloud. But if those entries do not have the ExcludeDelegate role applied, they will be removed entirely from the ACL upon migration. So how do you get these settings applied to all of your mail files in advance? You could add the entries using the administrator client. On the files tab, select a set databases then right click and choose Access Control – Manage. A dialog box displays that allows adding, modifying, or deleting ACL entries. It also allows creating roles. But the ability to actually applying those roles to ACL entries is missed. 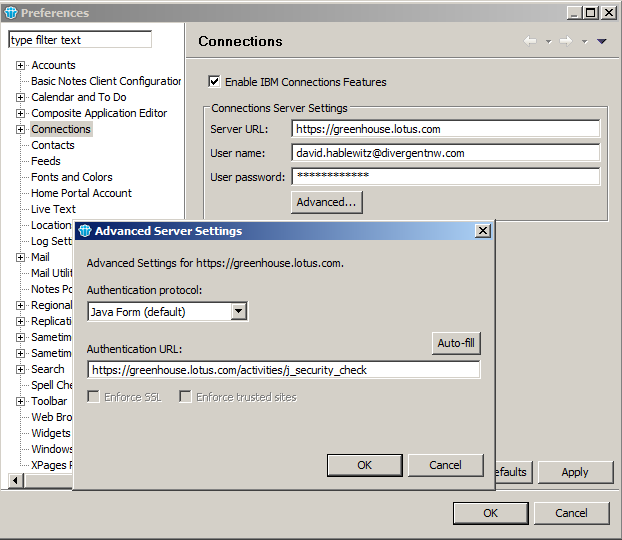 (I say BUG, IBM says “functioning as designed”) So the only way to assign a role to an ACL entry via the Administrator UI is to manually open each database one at a time and add the role to the entry. Not exactly convenient when trying to assign the [ExcludeDelegate] role to entries in hundreds or thousands of mail files before migrating them to SmartCloud. Please take a moment to open a ticket with IBM technical support and request that your company be added to this SPR. The more companies that request an enhancement, the more urgent they consider it. Meanwhile, you can accomplish this using third party tools, such as Ytria EZ ACL tool, a module in the suite of useful admin tools. (Contact me for a discount code) or you can write an agent to accomplish this task. Prepare your environment with these steps well in advance of migrating and things will be much less complicated at the time of migration.